Rabbit anti Bovine, Canine, Equine, Human, Mouse, Rat ADARB1 / ADAR2. 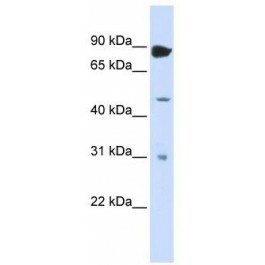 The immunogen for anti-ADARB1 antibody: synthetic peptide directed towards the N terminal of human ADARB1. Synthetic peptide located within the following region: NMSSSSTDVKENRNLDNVSPKDGSTPGPGEGSQLSNGGGGGPGRKRPLEE. ADARB1 is an enzyme responsible for pre-mR editing of the glutamate receptor subunit B by site-specific deamition of adenosines. Studies in rat found that this enzyme acted on its own pre-mR molecules to convert an AA dinucleotide to an AI dinucleotide which resulted in a new splice site. This gene encodes the enzyme responsible for pre-mR editing of the glutamate receptor subunit B by site-specific deamition of adenosines. Studies in rat found that this enzyme acted on its own pre-mR molecules to convert an AA dinucleotide to an AI dinucleotide which resulted in a new splice site. Altertive splicing of this gene results in several transcript variants, some of which have been characterized by the presence or absence of an ALU cassette insert and a short or long C-termil region.